Photo-matching is one of the most relied upon processes that professional authenticators use to determine whether game-worn jerseys and gear are real. In essence, the theory behind photo-matching is that no two game-worn items are alike. Each one has its own unique characteristics. These characteristics range from stains, including those caused by blood, grass and mud to sport-specific features like stick marks and board burns on hockey jerseys. Repairs, heavy wear and custom tagging are also used as evidence when authenticating an alleged game-worn jersey. All of these physical markings on a jersey or uniform piece can be identified and matched when compared to photographs from the exact games the jersey was supposed to have been worn in. This process is called photo-matching. Professional sports memorabilia authenticators often contract with archival image companies like Getty Images to use photographs for this process. The extensive libraries of such companies provide a tremendous amount of material that authenticators can use. According to MeiGray, one of the leading authenticators of game-worn or used sports memorabilia, photo-matching is not a picture that represents a jersey style. 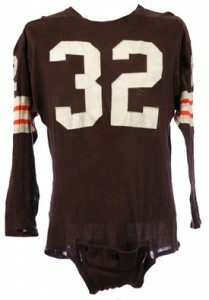 It's also not a picture that represents what a game-worn jersey looked like before it's use. By their definition, "Every game-worn item is like a fingerprint. If a jersey in question isn't conclusively determined to be the exact one pictured, it isn't a photo-match." Photo-matching is not the only process used by authenticators to determine the legitimacy of purported game-worn jerseys. Several other factors come into play before photo-matching can even begin. Provenance of the item in question starts with careful inspection of the jersey for player-specific markings like name and sizing. A history of the piece must be accounted for. Something as simple as the jersey coming from the right manufacturer for the period is one place to begin. Once these factors are considered and pass inspection, only then do authenticators attempt to photo-match the jersey or uniform to a specific game or season. Photo-matching can validate even the most subtle of clues. For instance, some athletes change their jersey at halftime or intermission. One particular player who employs this practice is Dirk Nowitzki. During the course of the second half of a particular game, Nowitzki went on to have a record-setting night. Authenticators were able to use photo-matching to determine which jersey was used in which half. They were able to do this by identifying several characteristics including items as small as stitching patterns. 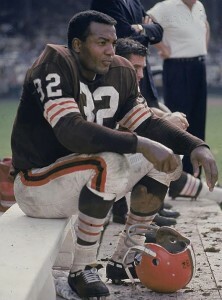 In another example, MEARS (Memorabilia Evaluation and Research Services) used the following picture to photo-match and authenticate this game-worn Jim Brown jersey. They were able to narrow it down very specifically to having been worn during the 1962-63 season. While photo-matching is an important part of the game-used authentication process, it is only one piece of a much bigger puzzle. However, it is a very important piece. The digital age has helped the photo-matching process by providing sports memorabilia authenticators with a seemingly endless supply of photographic examples. Collectors benefit from this process by being assured their items are authentic because as they say, pictures don't lie. Derek Jeter 2012 Game Used Batting Glove. Steiner Coa.